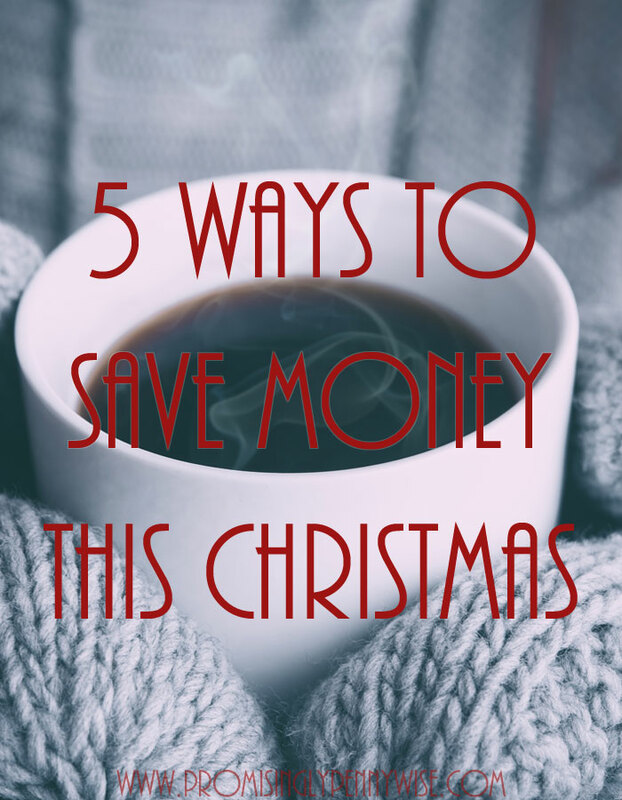 5 Ways to Save Money This Christmas: Tips to help you enjoy this Christmas on a budget. I enjoy almost everything about the Christmas season- delicious recipes, parties, decorations, bright lights, Christmas music, and finding the perfect gift for friends and family. Celebrating Christmas on a restricted budget, however, can put a damper on the season. Fortunately, it doesn’t have to! Our Christmas budget fluctuates year to year. Some years, we’re able to celebrate without a specific budget in mind. More often than not, however, we have a limited budget to work with. Over the years, several things have made sticking to a tight budget during Christmas necessary. One year we cut back on Christmas spending to instead invest in a trip to NYC the following year. The next year we purchased our home just days before Christmas. This year we’re expecting our second daughter just four days after Christmas. Fortunately, we’ve learned to enjoy Christms on a limited budget by following the tips below. Shop throughout the year: Take advantage of clearance items and special sales throughout the year. Though many stores have sales in the weeks leading up to Christmas, it can be tough to find a deal for everyone on your list in such a short time frame. Instead, start looking as early as the day after Christmas (see tip #2) for items your friends and family will love. Spreading out your spending this way also prevents your bank account from taking one huge hit in December. Buy the year before: Okay, this one won’t help you this Christmas, but can save you big for next year. Once Christmas is over, stores are eager to clear their stock of Christmas supplies. Many stores mark down their Christmas items by 50% the day after Christmas. This is a great time to stock up on wrapping paper, holiday decorations and even gifts. Stores that fill their shelves with holiday gift sets often mark them down as well. These make great additions to holiday gift exchanges the following year. Buy used: This tip is especially useful for for young children. I’m amazed at the items we’ve been able to purchase for G over the previous year and a half on a single income budget. Many of her favorite toys have come from garage sales, flea markets, thrift stores and Goodwill. Buying used items for adults is more challenging, but doable. When buying for adults on my list, I look for items in like-new condition, or find things that can be re-purposed. You’d be surprised how many new or like-new things you can find at thrift shops, garage sales, eBay, and even Goodwill. Don’t be Afraid to Re-gift: If someone gives me a gift I know I won’t use, I’ll store it until I find a person who would love it. (That is if I don’t return it or sell it while decluttering the house). I try to only re-gift if I know the person receiving it will actually enjoy the gift, or if I’m putting the gift into a Christmas party gift exchange. Price Compare: We often take advantage of online Black Friday sales, Cyber Monday and other clearance opportunities. However, it’s important to note that just because an item is on sale doesn’t mean it’s the best price out there. Before I buy a marked down item, I take a moment to do a quick Google search to see if it’s offered elsewhere for a better price. This is useful both when shopping online and in stores. Some stores will even price match if you show them that you found a better price elsewhere. Cut back: I know, this one doesn’t sound like much fun, which is why it’s a bonus 6th tip. Don’t worry, cutting back isn’t about sucking the enjoyment out of gift giving. It’s about getting more creative in how you give. There are several ways to do this. First, consider opting for homemade gifts like DIY Microwave Heating Pads or baked goods. No time for DIY? Consider a family gift exchange. With a gift exchange, each person randomly draws a name and buys a gift only for the peson they drew. You can also cut back by limiting gifts to stocking stuffers among the adults in the family. This has worked well for Gary and me. Instead of buying each other big gifts, we agree to buy smaller items, setting a specific budget. The first time we did this, I was surprised that instead of missing the bigger gifts, we had fun challenging ourselves to find small gifts that would be meaningful to each other. How do you save during the holidays? Such good ideas. We do need to get back to basics as we can lose sight of what Christmas is. Yes! When shopping starts to get stressful, it’s usually a sign to me to cut back. Good tips! I love shopping for Christmas all year long, it helps me keep the spirit alive all year. I am already done with all my daughter’s presents for the holiday so it lets me focus on my husband stress-free. That’s great that you’re already done with your daughters presents! I love shopping for our daughter at this age, because as a toddler I can hand her something to see how she interacts with it, buy it, and then put it away for Christmas. Once she’s older I won’t be able to get away with that anymore, lol. I do that too! I give her a toy and see if she is still playing with it by the end of our shopping trip. If she is, I buy it and put it away for later. I probably can only get away with that for one more year though. Such great advice Rachel. We love Christmas and our kids love opening gifts even though they are in their late 20s and early 30s. We take hours each person opening their gift while everyone watches. One of my sons finds gift giving one of his most favorite things to do in life (at Christmas only) and I can remember when I would allow them $1 to spend on gifts for grandparents and others and he was so thoughtful about what he bought. You can truly find some things that a grandmom would treasure at a dollar store when picked out by her grand child. Yes! I still love spending Christmas with my mom and sister even in my 30’s. Even when the budget is limited, it’s fun to open gifts together and enjoy traditions. #6 cutting back is my goal. We all already have more than we need or use. I’m looking at gifting more experiences this year instead of things. Thanks for the post! I love the ideas of gifting experiences! The first year we did stockings only, we planned a trip to NYC for the following Thanksgiving to see the Macy’s Parade. I absolutely loved it, and though it was only a 2 day trip because that’s what worked with our budget, it was one of the best Christmas gifts we’ve ever done! Great ideas. I often try to pick up things I see through the year so I will have something on hand, I do this for birthday shopping as well. Making your own unique gifts are priceless, because they end up one of a kind, and the time and efford put into them is something you cannot put a price tag on. Great suggestions!! My mother-in-law buys all of her presents right after Christmas for the following year. Unfortunately, I’m not that organized, but we can always hope. I haven’t made it to buying all of them right after either! Great ideas! I love to get a good deal on a gift at a thrift store! I'm Rachael: wife, mom, homemaker, Christ follower, and former teacher with a passion for saving money, simple, healthy, and affordable recipes and tips for daily life. Learn more about me. © 2015-2017 My Pennywise Life. All Rights Reserved. All recipes, images and content are original and the sole property of MyPennywiseLife.com. If you give credit and a link back to My Pennywise Life, you may use one photo. For any other use, you must first contact us for written permission. Dear Mom, Thank you for all the things you did right.